He (Pat Mackie) sees his own needs very simply, voices them fearlessly and becomes a phenomenally effective workers’ spokesman and trade union organiser, a power to be reckoned with in the industrial world. His strength lies in his formidable combination of his magnetic personality with high abilities in three functions of leadership: in clearly analysing the workers situations: in democratising their organization: and in brilliant powers of oratory, enabling him to unite the rank and file and fire them with unshakeable loyalty. He becomes the object of punishing hostility from all the forces of the establishment, union bureaucrats as well as employers, who feel their interests threatened by his existence. The above quotation, written by Elizabeth Vassilieff in the Preface to the book, is an excellent description of Pat Mackie’s attributes. In the mid-1990s some close friends and I had the privilege of spending several hours in a Sydney pub with Pat. During this time we heard many stories of his most interesting and turbulent life. Prior to this I had only known Pat as the main union leader in the 1964-65 Mt Isa strike and as Australia’s only self-declared wobbly (member of the Industrial Workers of the World). The stories we heard that afternoon were a small sample of the ones that are recalled in his autobiography leading up to the Mt Isa dispute, Many Ships to Mt Isa. This book was published in 2002, and is essentially a condensed version of a series of tapes, recorded in 1967, that were edited by his long term partner Elizabeth Vassilieff. After reading this book, I have formed the view that the Mt Isa dispute was a simple ‘walk in the park’ for Pat, after his union involvement aboard many ships that travelled the world and his rank and file activism and full time organisational work in North America. After spending many years at sea Pat settled in Vancouver prior to the Second World War and got married. He was an active unionist in the British Columbia Seamen’s Union, which had a significant victory in winning union hire coverage from the powerful Canadian Pacific Railway. After working in the ship yards for some time, Pat took on the role of a full time organiser with the aim of ‘organising the unorganised’. However the Second World War took Pat to sea once more, this time transporting war materials to Europe. In this short review it is difficult to do justice to Pat’s life. Pat was born in New Zealand, but his father was Australian. Pat went to sea very early in his life, mainly because he wanted to get to America. However, from 1934 to 1949, the many difficulties he encountered along the way took him to numerous places; back to New Zealand, Australia, Panama, Tahiti, Hamburg, London, Antwerp, Mexico, Vancouver, Montreal and New York. During these times he not only threw himself into intense union activity, but married, fell in love a number of times and wrestled professionally. One of Pat’s most notable achievements was, in 1948, to be the Captain of Picket Captains on the New York waterfront during a lengthy strike. The pickets encountered police on horses trained to rear up at them and the police viciously swung batons at the picketers. Armed gangsters were paid to go in to the picket line to start fights. The unionists threw marbles under the legs of the poor horses in order to counter these gruesome charges and the pickets held their own against the thugs and gangsters. In many parts of the world Pat had various differences with the police which led him to spend time in jail on numerous occasions. His final year in North America was spent in a number of Montreal prisons on charges indirectly related to his union activities. Pat was deported back to New Zealand but in 1949 ended up in Sydney. He heard there was money to be made from mining at Mt Isa and he decided to work his way up from Sydney. He stopped off in Brisbane and worked as a painter for a few weeks after obtaining the job through the union based which was based at the Brisbane Trades Hall. An incident with the Brisbane police triggered his early departure to Bundaberg. In Bundaberg he observed police pushing around and arresting an Aboriginal man. When he followed the police to their station to complain to the sergeant of the brutality handed out to the Aborigine, he was threatened with arrest. Pat claims that it was the most brutal act towards a fellow human being that he had ever encountered despite having been the subject of arrest from a number of the world’s police forces. This is an interesting observation of racism in Queensland in the post war years. Pat arrived in Mt Isa in 1950 and worked for the Company (Mount Isa Mines) but was soon labeled a trouble-maker and decided to go out of the town and mine independently. He did this for over ten years and despite having various ups and downs was able to make a reasonable living for himself. His dream was to save up enough money to build a Tahiti Ketch, a small boat that would take him sailing around the world. Pat would often visit Mt Isa to pick up supplies and became a local identity. Another interesting aspect to this period of Pat’s life was his name actually becoming Pat Mackie. He was originally a Murphy, became Eugene Markey, Pat Markey and eventually Pat Mackie. The reasons for all these changes are too involved to go in to here, but a lot had to do with mis-spelling of his names on pay slips, and the way he entered a number of countries. This is indeed a most interesting and important book. It not only chronicles the life of one of Australia’s most famous trade union figures, but contrasts the styles of union activism and organisisng in Australia and North America. I had to live and work there, especially on the east coast and New York, to grasp the fierce reality of the class struggle and to know how ruthless the employers are, constantly on the attack against workers’ conditions and wages, and the need for the never ending day to day fight with no holds barred, for workers to maintain what standards they achieve. This book is also important from an ideological perspective. Pat mentions the influence of the Industrial Workers of the World a number of times in the book and it is evident that his style of union activism and organistion was in line with the wobbly tradition. He was a unionist first and foremost. He worked with communists, at one stage nearly joined the Canadian party. He maintained a position against forces that tried to eradicate communists from the union movement. However when confronted as to his ideological position, he would clearly define himself as a wobbly, working tirelessly to improve the working and living conditions of the rank and file. 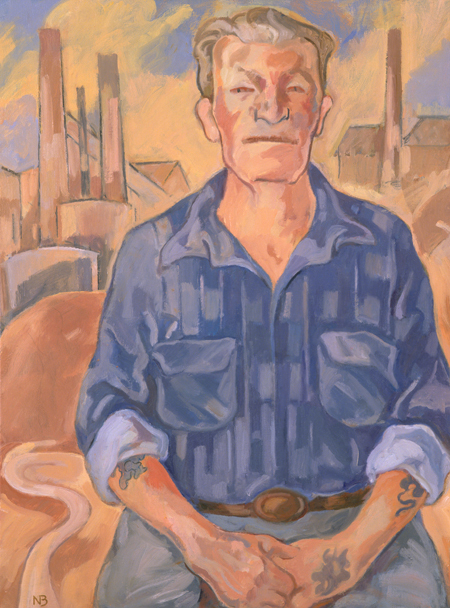 His second book Mount Isa, The Story of Dispute chronicles this struggle in Mt Isa in 1964/65. Pat Mackie review ( 31.1.08 ) by Greg Mallory. Many Ships to Mt Isa: Pat Mackie’s autobiography. His work and travels before the Mt Isa Dispute of 1964-65. Pat Mackie with Elizabeth Vassilieff. Seaview Press, South Australia, 2002. paperback, 371 + xiv pp. This entry was posted in Books and Reviews, Recent, solidarity, Unions, Workers Political Organisations. Bookmark the permalink. Many ships to Mount Isa : autobiography /​ Pat Mackie ; edited by Elizabeth Vassilieff Wolf. Henley Beach, S. Aust. : Seaview Press, c2002. xiv, 371 p. : ill., ports. ; 21 cm. Miners — Queensland — Mount Isa — Biography. “Pat Mackie’s autobiography: his work and travels before the Mt Isa dispute of 1964-65” — Cover. I have seen this site sometime ago but like many who lived through this dispute as a child most that I read about the event is untrue. Today I decided to read the comments and the tears started coming back as I too remember this terrible time in my life. I was in grade 5, 6 and 7 when this event happened and unlike many I had a close contact with Pat Mackie, as my father took over from Pat when he was ousted. Pat was not the saviour that people have written about, and also the newspapers of the time wrote constant lies about the men, wives and children of the workers. The trouble now is that many of these women and men have passed on so the truth of what it was really like the young of today will never know. My family was constantly harrassed and attacks were made on our rented property by men who wore disguises and these attacks happened mostly at night. Sometimes in the street my family would have abuse yelled at us from passing cars or we would have people spit at us. Something that a lot of people do not understand is that our home had no income whatsoever. No wages, no relief from the Government…nothing. But we survived with the generosity of the unknown people who would leave small parcels of food or dishes of food on our doorstep. Many weeks at a time my father would be away in Brisbane for meetings to try and settle the lock out which made it so difficult for my mother. The police had the power and they did search our house anytime day or night without a warrant which made us all feel like we were criminals. I will never forget this time in my life and I will never forgive the Government of the day, the Police, the Newspapers (controlled by MIM) or Pat Mackie for how the innoccent were treated. This event for me was a very dark time in Australian History where our childhood was taken from us. To all the children of the Mt Isa Mine Lock Out, hold your heads up high and walk proud as your parents did more than you can know for equal opportunity and discrimination in Australia. Thank you Colleen for your reflections. I recommend your comments to our readers. For too long ‘the big man syndrome’ has been prominent in union organising. More and more it is women who are crucial for the success of the union. This video about the strike at General Motors in 1937 in Michigan With Babies and Banners testifies to the importance of women in times past. These days times have changed from the big industrial disputes in the large factories. Capitalism has changed. Have workers organisation responded? I know that we have ACTU leaders like Jeannie George and Sharan Burrows but it is women (and men) working in the offices and the large bureaucracies that are being bullied and exploited now just as they were in the days of big factories like the car plants depicted in With Babies and Banners. For Colleen and others who are interested in the history of the Mt Isa Dispute the National Library has a copy of Storm in the tropics : the historic Mt. Isa dispute, 1964-5 / by Pete Thomas at http://catalogue.nla.gov.au/Record/295622 . You may be able to organise an inter library loan from your local council or shire library. It is only a short booklet of 64 pages, I have included the library description below. Description Brisbane : P. Thomas, 1965. Thank you for sharing your personal experiences of the Mt Isa Mines dispute. Not enough has been told of the role of women in the dispute. I am glad you have put that on the record. The first account I read of the dispute was ‘Storm in the Tropics’ by Pete Thomas. Mt Isa womenfolk took their place solidly with the men. The three women were Mrs. Sally Murray, the Auxiliary’s president (she came to Mt. Isa four years ago from New Zealand ); Mrs. Estelle Deutekom, the secretary (40 years in Mt. Isa, mother of a 3yr-year-old girl), and Mrs. Ann Parker, the treasurer (came to Mt. Isa straight from England nearly two years ago) . They said that, though they had found women anxious and though there had been cases of distress and even destitution, they had not found hostility among them towards the men’s struggle; the hostility was towards the company. The women’s organisation started with ten members to deal with cases of distress. The ten had stayed behind in response to a call, after a mass meeting in December. The organisation became the Mt. Isa Women’s Auxiliary, affiliated with the Mt. Isa Trades & Labor Council and sending delegates to it. It grew till some of its meetings had over 100 present. The Auxiliary women see their role as extending beyond the dispute. They have set themselves the aim of making Mt. Isa a better town to live in. They want cheaper prices, lower rents, and a lot of other improvements. Recently there was a Q150 conference on the history of labour relations in Queensland sponsored by the Qld State Government. I had been accepted to present a paper 'After the Waterfront - the workers are quiet' but declined their offer and did not attend. But industrial unionism secured the support of a very large number of unionists and the One Big Union soon became the most prominent question in the whole field of unionism. The A.W.U., although on the surface a basis for the O.B.U., was in reality just a mass organisation under the control of a central authority and in close alliance with the Australian Labour Party. With its usual opposition to any movement that threatened the dominance of the A.W.U. that organisation bitterly fought “The Reds,” as all militants were termed, and denounced as disruptives all those inside or outside the union who urged the claim of the O.B.U.— Chapter XIII. Militancy Sabotaged. I wondered if the Q150 conference goers had seen the billboard on the corner of Dorchester & Gladstone Road, Highgate Hill, not that far from the house 'Cosme' where Ernie Lane lived nearly 100 years ago? It reads: "ANNA BLIGH SOLD US OUT". That says a lot about an IR conference of Labour academics and practitioners that they would point to the AWU (Australia's Worst Union?) as being the main problem for industrial relations in Queensland. So they think the malaise is not the Treasurer (Andrew Fraser) and the Premier (Anna Bligh), it is not the Labor Party, it is the AWU? When opposition to privatisation is in the high 90s you would think the June State Labor conference could not be so stupid to back the sell off of public assets, but it appears that they are. Even allowing for polling bias, with public opposition in the in the 90+ %, it is a pretty clear indicator, don't you think? Say the polling figures were out by 30% and opposition is 60% what democratically elected government could survive that level of opposition? And it is the Anna Bligh led 'Left' faction of the ALP that wants to float QRail on the stock exchange. Even Brian Laver & Mitch Thompson (one, a local libertarian; the other, a former student radical) would not come up with a plan that crazy. I mention these two because they are reputed to have funded their ventures in the 1960s by playing the stock market. You would think the State Labor government would get cold feet after the public float of Telstra. Did anyone win out of that debacle? Telstra shareholders? Consumers? Workers? Retirees? Of course the ALP does not have a 'Left', not since George Georges. If you don't know who George Georges is, he was a labor Senator for Qld who resigned from the Labor Party when the Hawke Federal Labor government de-registered the Builders Labourer's Federation in 1986. Nowadays even the AWU comes across as being to the Left of Rudd & Swann on border security, on privatisation, on refugees. But then the proverbial Genghis Khan is to the Left of Rudd and the rest of the Queensland mob. Is there anything in history that prepares us for this? I ask myself, will an old wobbly's reminiscences of the 1964 Mt Isa mines dispute help us understand the current crisis for workers and their unions? Sure the mining multinationals are still here ripping off the workers and tearing up the land that does not belong to them. That has not changed. Even knowing our vanished past, does that help us understand why the State Labor Conference in June 2009 voted 207 to 156 in favour of selling ports, rail, power and water? Somehow I do not think history explains this. I think that we need to be creative in our interpretation of these events and to do what is needed to resist the sale of public assets. We could begin by realising our problems are contemporary, they may have origins in the past but they are not buried there, so they can be changed. When Che Guevara was asked whether or not we are Marxists, he said our position is the same as that of a physicist or a biologist when asked if he is a “Newtonian,” or if he is a “Pasteurian”. There are truths so evident, so much a part of people’s knowledge, that it is now useless to discuss them. One ought to be “Marxist’ with the same naturalness with which one is “Newtonian” in physics, or “Pasteurian” in biology, considering that if facts determine new concepts, these new concepts will never divest themselves of that portion of truth possessed by the older concepts they have outdated. Such is the case, for example, of Einsteinian relativity or of Planck’s “quantum” theory with respect to the discoveries of Newton; they take nothing at all away from the greatness of the learned Englishman. Thanks to Newton, physics was able to advance until it had achieved new concepts of space.